Be yourself. Accept who you are. 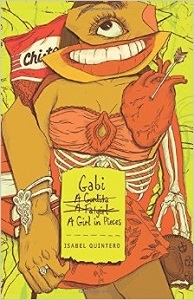 These words of advice are easy to say, but Gabriela “Gabi” Hernandez learns to live them in the book Gabi: A Girl in Pieces by Isabel Quintero. Gabi is a Mexican-American high school senior in Southern California, who experiences life between two cultures. Readers see pages from Gabi’s diary as it jumps from English to Spanish. Gabi’s story captures how it can feel to be a Mexican-American stuck in and between two different worlds. Throughout the narrative, Gabi learns to be more accepting of herself. Initially, she lets the opinions of others—about her body, for example—affect how she thinks about herself. Like many, Gabi feels pressure because society tells teens countless times that skinny equals attractive. As she grows throughout he text, Gabi becomes bold: she speaks about all sorts of things that teenagers can relate to, such as body image, sexuality, growing up, and dealing with the pressures of high school. She’s hilarious, honest, and authentic. Throughout the story, Gabi matures as a person by learning many life lessons. Poetry is her passion; reading and writing help her express how she feels, develop self-confidence, and cope with issues that are beyond her control. In her diary entries, Gabi offers an unfiltered, raw perspective on life. Gabi faces her fair share of challenges: her dad is a meth addict and an inconsistent presence in her family; her two best friends deal with crises of their own; and her insecurities overwhelm her daily. Nevertheless, Gabi tries to be a “normal” teenager and graduate so she can eventually attend her dream college, the University of California-Berkeley. She hopes to be the first one in her family to attend college. The novel’s author, Isabel Quintero, was born in Riverside, California, just like Gabi. Quintero currently lives in the Inland Empire of Southern California with her husband Fernando. An elementary school library technician, she teaches community college part time, writes for the Arts Connection of San Bernardino, and works as events coordinator for Orange Monkey Publishing. Quintero credits her mother and teachers for her love of reading and writing. I recommend this book to students in high school who can share its funny moments with friends. Gabi: A Girl In Pieces is relatable. Once readers get into it, they won’t want to put it down.